The UAE has become something of an expat haven. The culturally diverse Middle Eastern country boasts high salaries, plenty of career opportunities, and in many cases, improved quality of life. However, despite the perks of earning a tax-free salary, many expats struggle to navigate some of the nuances that come with Abu Dhabi’s financial landscape. Housing can be tricky to find, banking confusing, and you’re on your own for things like investments and retirement. 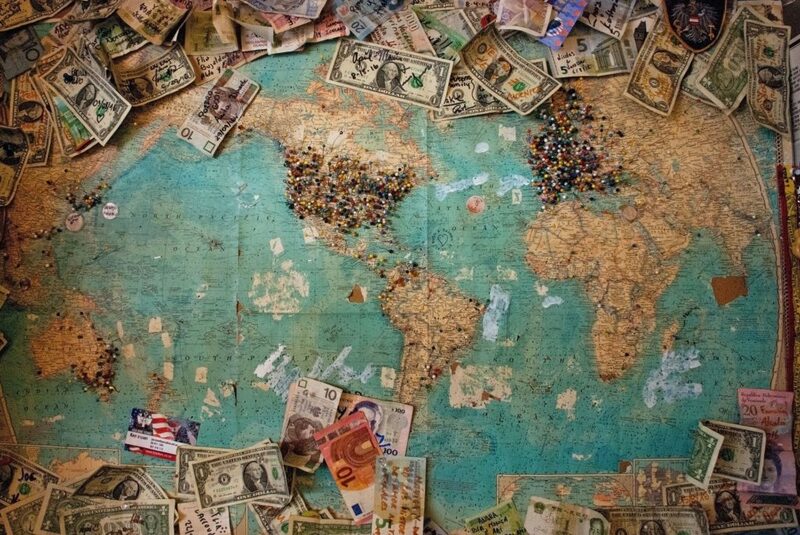 Aside from the cultural differences and the challenges of starting a new life away from home, expats have a lot to learn when it comes to navigating a different financial landscape. So, how do you make a living and manage to build up your savings, too? Here’s what you need to know about finance in Abu Dhabi before you hop on the plane. From budgeting to saving, here are some tips for staying financially secure while working in Abu Dhabi. Click here for your free download. Is the Luxury Life a Dream? Abu Dhabi salaries, unlike those in other high-cost cities, actually match the cost of living. So, if you play your cards right, you’ll be able to live comfortably. Salaries in the UAE are often way more generous than our earnings back home. That’s part of the draw, after all. That said, a study by Guardian Wealth Management found that even high-earning expats have trouble contributing to their retirement fund or saving a portion of their earnings. Another survey conducted by YouGov and HBSC found that the top three financial concerns for expats are the cost of living, increases in rent, and the inability to save. So, while access to luxury goods and great meals is more democratized than back home, don’t forget about those less-glamorous costs waiting down the line. In Abu Dhabi, expats do not pay income tax, and as such don’t make any contributions toward social security or pensions. However, this means that expats will need to find an alternative way to save for retirement. Don’t expect your employer to have your back when it comes to helping you build a nest egg for your golden years. According to the HSBC report, only 44% of UAE-based respondents felt that they’d be comfortable in retirement. And 63% of those respondents said they planned to work, at least part-time, into retirement, which implies these folks are banking on maintaining employability and good health. Which, let’s face it, are not sure things. Unfortunately, despite the promise of high salaries and a comfortable lifestyle, UAE expats struggle to save due to the high cost of living. If you’re in your 20s or 30s, this might not be the most pleasant thing to think about. We get it. However, it’s smart to start laying the groundwork for your later years. Consider setting up a meeting with a financial advisor who can help guide you through some of these decisions. Get real about your needs — meaning, how much it will cost to buy food, live in a nursing facility, pay for rising healthcare costs, and so on. Not to mention, the costs associated with maintaining your quality of life. Budget for savings — What percentage of your monthly pay can you set aside for savings? Make sure that you’re realistic about how much you can save without cutting into your food budget, transportation, etc. Create a contingency fund — Your contingency fund should be separate from your savings. This money should cover things like an emergency flight home, unexpected medical costs, or auto repairs. Plan for the future — Where will you live? Do you plan on traveling? Paying for your kids’ college funds? Try to find the right balance between high-, medium-, and low-risk investments. Since you likely won’t have a traditional 401(k) plan, you’ll want to diversify. Open an IRA or a Self-Employed Plan (SEP), and look into making some strategic investments with your earnings. What’s the Real Deal with Taxes? The UAE is known for its rising reputation as a tax haven. If you’re an American expat, however, you’re beholden to the US government no matter where you live. As such, the tax-free appeal of moving to the UAE isn’t all it’s cracked up to be. From a tax perspective, working as an employee abroad is similar to being self-employed in the US. You’re still obligated to pay taxes to the federal government, and you may be required to file a return on any assets held in foreign banks. That said, there are some provisions in place that can reduce US expats’ overall tax bill. The Foreign Tax Credit: This credit allows you to reduce the total amount owed based on fees you’ve paid to a foreign government. Foreign Housing Exclusion: This exclusion allows you to exclude certain portions of your income, based on the price paid for household expenses incurred while living abroad. Foreign Earned Income Exclusion: This exclusion allows you to decrease your taxable income by the first ~100,000 earned abroad. While you will need to track your spending, keep receipts, and records, there’s a good chance you won’t end up owing much to the US government during your stay in Abu Dhabi. Most countries rent apartments on a monthly basis. You might put down a deposit and first month’s rent to secure the place, but from there, it’s a predictable monthly expense. In contrast, renters in the UAE pay their rent on a quarterly or yearly basis, while salaries tend to be paid once a month. While that likely shakes out to the same amount earned and spent each month, getting used to a new payment schedule can be a bit tricky, especially if you’re shouldering the costs of moving to a new country, finding an apartment, and paying a large lump sum upfront. Working with a real estate agent might be a good idea, especially if you’re completely overwhelmed by the process. In most cases, you’ll need to pay a 5% fee associated with the contract, plus a deposit for the apartment. Additionally, extras like paying for a water delivery service and air conditioning will also involve deposits. Utilities such as water, electricity, and internet will cost extra, as is the norm in most places. If you’re renting a property in the UAE, you’ll need to have a work visa and a bank account before you can lock down a place. Expats looking for housing should also check Abu Dhabi’s government website for information about housing rules and regulations before attempting to sign any contracts. The healthcare system in Abu Dhabi is a mix of public and private networks. There’s a public healthcare system in place for UAE citizens, but expats, who don’t pay taxes, are not eligible for coverage. Health insurance is a legal requirement for all expats, and your employer is responsible for providing minimal coverage. However, many expats choose to upgrade their coverage for more comprehensive access to care. Public medical facilities in UAE offer a high standard of care, comparable to the level of care you’d find in the EU or the US. But they may be overcrowded and difficult for foreigners to navigate. In most cases, you’ll go to a private hospital to receive care—however, cases of trauma or emergency fall to public hospitals according to UAE policy. There are a few different options available to foreigners seeking to open an account. Several financial institutions cater to the expat community, allowing newcomers to open checking accounts and take out loans. That said, the country’s monetary policy prohibits foreigners from opening bank accounts in the local currency, the Arab Dirham. Meaning, your easiest bet is working with an international bank like Barclays, Citi Bank, or HSBC. Opening a local bank account does pose a few challenges, but they may be worth the initial headache. For one, not all banks provide foreigners with account access. Two, you’ll need to provide a lot of information to get an account. Personal details must be presented in the form of a CV, listing professional and business experience. Additionally, you’ll need to show your passport, latest utility bill, and about six months’ worth of bank statements. What’s more, non-residents may be subject to minimum balance requirements, which vary by institution. Alternatively, you may be able to open a resident account, so long as you secure a visa through your company. Talk to your employer ahead of your move to find out if your new company will help you get your resident visa. Moving to Abu Dhabi is an exciting chapter in your personal and professional life. But don’t go unprepared for a different financial system. Failing to do your research or build up savings can leave you exposed far away from home. Our recommendation? Get prepared as soon as the job offer comes in. Start researching banks, insurance, and a reputable real estate agent in advance, so you’re not dealing with financial woes while trying to get settled. Finally, if you’re thinking about signing up for a new adventure abroad, sign up for a Job Nexus account. We connect working professionals with recruiters in Abu Dhabi, Dubai, and a whole range of locales outside of the UAE. We mentioned in the main article that navigating financial changes along with a new culture and a new job is no easy feat. Between locking down a place to live before starting a new job and planning for retirement without a 401(k), there’s a lot to think about ahead of the big jump. No one wants to think about an illness in the family, a significant injury, or a job loss, but these things happen. The general rule of thumb is to have at least three months of salary saved up in the event of an emergency. And because you’ll be away from your home country, bulking up the emergency fund beyond the three-month recommendation is smart. Consider additional costs like last-minute international flights, unexpected housing costs, illnesses, accidents, and any other misfortune you can think of. The point is, be prepared, and then some. Tracking your money can feel like a drag, but it gets addictive over time. Apps like Mint or PocketGuard can help you stick to a budget without the old-school envelope approach. To create a budget, start by listing your income—which means any income you receive from rental properties, dividends, and your salary. Then, make a list of expenses. Things like food, utilities, rent, and transportation costs will be the first items on the list. Also account for the costs associated with socializing, buying new clothes, and meals out. Don’t forget about retirement and stocking your emergency fund. Between the malls and the excellent dining options, there are plenty of establishments just waiting to take your money. And when exploring a new place, there’s some spending involved. It’s unrealistic to assume you can just steer clear of the Abu Dhabi attractions. A new life means putting yourself out there and socializing—at bars, restaurants, and so on. But, all of these activities add up fast. While we don’t recommend brown-bagging it 100% of the time, it may be worth it to start exploring the local markets. Try learning to cook with local ingredients to save some cash—at least a few times a week. Better yet, make it a team effort, as a little culinary exploration could be a way to get to know your fellow, displaced expats a little better. Add entertainment to your budgeting app of choice—and give yourself an allowance. Split up socializing and buying extraneous items, if you’d like. A trip to the mall here and there or the occasional Friday brunch can do you good, so long as it’s within your budget. Choosing a developing area or suburb might be a good option if you’re trying to reduce your overall spending. While cooking at home and looking for deals on brunches and clothing items will save you some cash, the best way to pare down living expenses is to slash the big-ticket stuff like purchasing a car and paying rent. 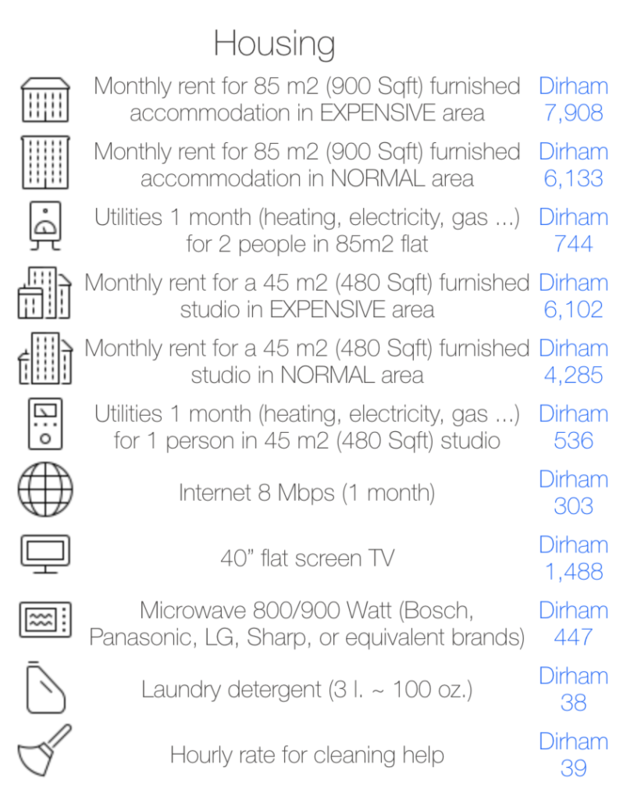 According to an Expatistan cost of living report, renting a 900-square foot apartment in the Abu Dhabi city center is roughly 2,000 Dirhams more per month than a similar apartment in a less cosmopolitan part of town. Suburban life will likely require a car, while living in the city center would allow you to take public transportation to and from work. There’s no shortage of expats in the UAE, and as such, there’s a high-quality second-hand market for things like cars and furniture, as well as big-ticket electronics. People leave and can’t take these items with them, presenting an opportunity to get a gently used car for a major discount. Check unlikely places like Facebook community groups for miscellaneous items from TVs to couches. Or look toward the site, getthat.com for cars and properties. For furniture, Abu Dhabi’s Nefertiti Furniture allows you to buy and sell everything from antiques to dining sets. As we mentioned in the main article, expats are not on the hook for taxes in the UAE. However, you may have to file taxes as you would back home. If you’re a U.S. citizen, the IRS still requires that you submit a return, though some of the loopholes will dramatically reduce your bill. Still, it’s smart to set aside the amount you’d normally pay the government, just in case. Make like a freelancer and store a percentage in a separate savings account—this way there are no surprises come April. For reference, here’s an easy tax calculator, courtesy of The Motley Fool.